The time period between the First World War and the second has always fascinated me. The environment that Hitler had in order to make his rise to power had to be just right. 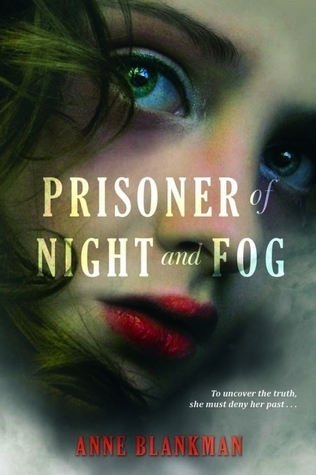 Prisoner of Night and Fog looks at pre-World War II Germany through the life of one of the Nazi Party’s girls. She’s held in high regard because her father died for Hitler. She’s never questioned what her father was fighting for. That all changes when she learns that the story of her father’s death might not be the truth. Gretchen has always believed in Hitler and his ideals. Her father died to protect him, so she sees no reason to think Hitler’s wrong. She’s not quite like other Nazi’s though. She still has compassion, and that gets her in trouble one evening. When a Jewish reporter sees her try to stop her brother from beating a Jew, he begins to reach out to her. He claims the story she’s been told about her father’s death is wrong. She doesn’t want to believe him, but when things start pointing her towards the truth, she questions all the beliefs she’s grown up with. I enjoyed Gretchen’s character. I’ll admit that I was worried. How can you take a person who so strongly believes in what Hitler talks about and make her likable? Or if she’s really that ignorant, why should we think she’s trustworthy? But Blankman pulled it off. She made Gretchen just ignorant enough, just compassionate enough, that her transformation from Hitler’s pet to Hitler’s despised felt real. It was clear that she wasn’t sure how she was supposed to feel about Daniel. In the beginning, it was clear that she believed Hitler’s statements about the Jews. She had grown up being told they were horrible and subhuman. But when she sees that’s not really true, she has to reexamine everything she’s thought. Daniel was fantastic. It’s clear that he knows Gretchen’s thoughts can’t change overnight, but his belief that she needs to know the truth makes him stick with her. He starts to change her mind about the Jewish population, proving that Hitler is wrong. When he exposes just how deep Hitler’s hatred goes, it’s a shock to Gretchen, but Daniel waits until she can come to terms with everything she’s learning about. He’s strong and wants to fight what’s coming in the best way he knows how. I was fully engaged in the plot. There was history mixed with new characters. Seeing Germany struggle and how Hitler took advantage of that was really interesting. Not only that, but to see Gretchen have her dreams and goals, yet also see them fall apart right in front of her broke my heart. I’m incredibly happy the story isn’t over yet. Gretchen and Daniel still have so much to do and so many stories left. This series will definitely be one I watch. The history was what made me pick Prisoner of Night and Fog up, but the characters are what kept me reading. This entry was posted in Historical Fiction, Mystery, Thriller, and Suspence, The Must Reads, Young (and New) Adult and tagged Anne Blankman, Historical Fiction, Mystery/Thriller, Young Adult.